It has been nearly two years since I spent a weekend in the Northern California backwoods at my friend Lori's family cabin. Maybe some of you remember? The cabin is nestled deep in the woods on a huge plot of family-owned land, miles down an unpaved dirt road. I love the cabin. It was hand-built and is just the right combination of rustic and comfort - think plywood floors and down comforters. Well, apparently I behaved well enough last time to get an invite back two weekends ago. Plenty happened in those 48 hours - we watched a stunning moonrise from the cabin porch, rescued a baby possum, attempted to summit a mountain, flipped through endless magazines, and ate and drank puh-lenty. Lori made this delicious couscous for us and I thought I'd share it. It is simply cherry tomatoes, cucumber, chopped basil, and chickpeas tossed with the couscous, olive oil and freshly squeezed lemon and lime juice. Finished with a bit of feta, it's a great way to use some of those cherry tomatoes that seem to want to hop right in my market bag at every turn. Thanks for another great weekend Lori, Lisa, and Gwen - can't wait for our next cabin adventure. Keep your eyes peeled for whole wheat or barley couscous - either would work great here. You can easily make this vegan by leaving out the feta - maybe do some sort of harissa drizzle instead? Combine the couscous, tomatoes, cucumber, and chickpeas in a large bowl. Lori - squeezes the lemon and lime juice directly into the bowl, so start by giving a good squeeze of lemon and lime juice into the bowl, add the olive oil, and some salt and pepper. Toss well, taste, and adjust with more of the above until it tastes just right. Lori notes - this really needs a generous amount of salt, and the lemon and lime juices might need to be adjusted depending on how juicy the fruit is. Add the basil and feta and toss gently until it is evenly dispersed. *To cook the couscous: Either follow the package instructions or bring 3 1/2 cups of water to a boil, stir in a scant 2 teaspoons fine grain sea salt and 2 cups of couscous. Cover and remove from heat. 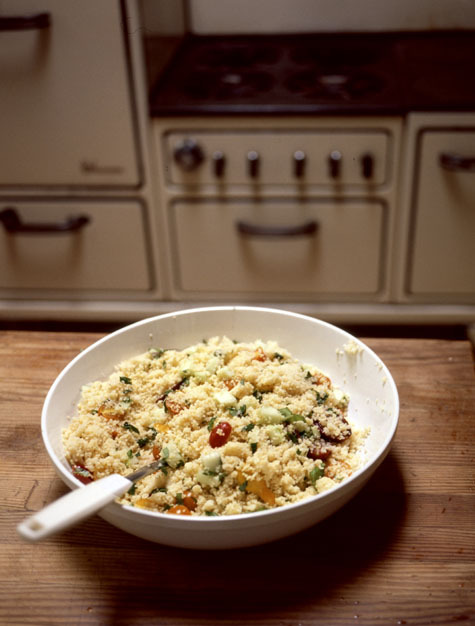 Steam for 5 to 10 minutes and then use a fork to fluff up the couscous. For the sun-dried tomato lovers out there. Goat-cheese raviolis tossed in a sun-dried tomato red pesto sauce, served over baby spinach.